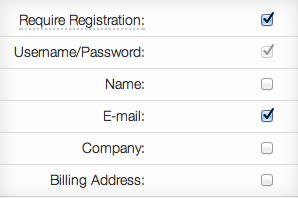 Authorize customers via their mobile phones, advertise your business by your Wi-Fi Start Page! Your hotspot can only be accessed by customers with a valid mobile number. Numbers can be used to track people in case of illegal activities in your hotspot or can be used in an SMS advertising campaign. In some countries the law requires to identify and track users who use public internet channels. Examples are CALEA laws in the US, Directive 2006/24/EC in the European Union, and there can be country specific laws, like the Pisanu Law in Italy. Compliance with Telecommunication Laws is ensured this way. 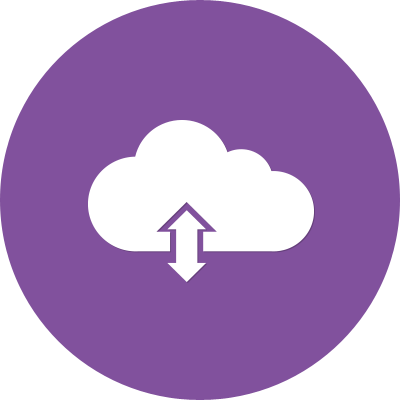 Capture additional data from your free users by forcing them to register an account. That way they can access the hotspot with a username and password they choose instead of an access code. Additional data can be captured, such as name or e-mail address. Up to 5 custom questions can also be captured, like room number or a feedback. 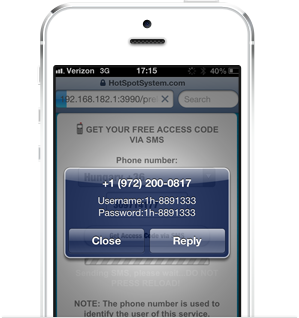 Access can be restricted to one access code per phone number within a predefined time. That way you can avoid heavy usage by one user which can get your network overloaded. 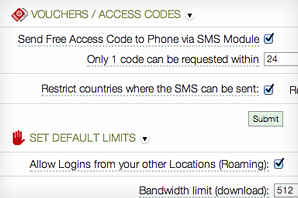 Restrict country code of mobile numbers so only local people can access your hotspot. Individual users can also be blacklisted. You have full control over your hotspot users. By using the customer API and your favourite API enabled SMS provider, you can add phone numbers to your SMS campaign automatically. HotspotSystem also teamed up with Zapier so you can integrate the service with global SMS providers like Twilio without writing a single line of code! Check out our Zapier tutorial or the API documentation to learn more about integration possibilities. Cloud-based Control Center gives you the power to manage unlimited hotspot locations from a centralized interface. Check the number of transactions, sessions, user data, traffic consumption by user or locations. Get e-mail alerts when a router stop working. We support many hardware and firmware which you can use to run the client software directly. It will communicate with our web, database and radius servers and handle redirection and authentication. You can also use your existing hardware and network if you put a hotspot gateway device behind your network. This can also be a supported router or even a PC. In this case you don't need to change your existing configuration to make it compatible with out system, you only need to add one more device. It is possible to remove all HotspotSystem.com related text and graphics from the Splash pages and replace it with your own branding. You can even use your own domain name so the service will look like as it is was your own. This option requires an extra one time setup fee.